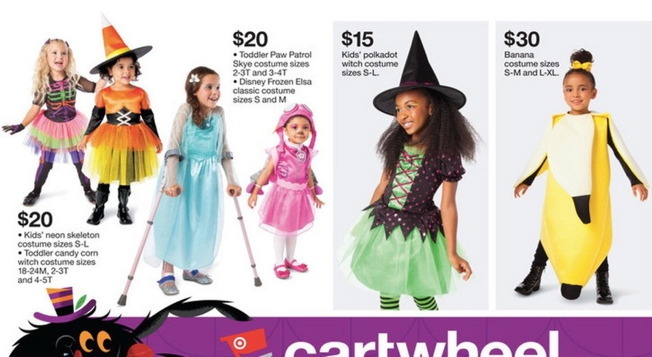 Not long after removing the gender labels in its toy section, Target has once again impressed the social justice wing of the Internet—this time by using a model with braces and arm crutches in a Halloween ad for children's costumes. The model in question is a little girl wearing a Princess Elsa costume from Disney's Frozen. The ad itself went viral after the mother of a child with a disability posted it on Facebook. "Dear Target, I love you," she wrote. "Thank you for including a child with braces and arm crutches into your advertising campaign!" Others took to Twitter to praise the ad, and Target for its ongoing dedication to diversity. In case you'd forgotten, Target used a child model with Down syndrome in an ad a few years ago. It also revamped its plus-size clothing line earlier this year, and debuted its first-ever plus-size male model this month. This is, of course, a creative way to compete with Walmart, whose public image is a blend of convenience and tone-deaf heartlessness, as well as a way for Target to distract from its own union-busting. But whatever the motivation, it's hard to ignore the impact of Target's diversity efforts on people who don't get much public representation.